Grapher is a online graph Plotting tool, it can plot a given set of (x,y) coordinates or any fuction of 'x'. The program can be fully customized to change colors, text size, etc. 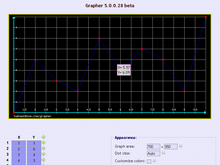 It has lots of features which helps in easy analysis of Graphs. This is a strong PHP obfuscation tool, you can protect the your PHP scripts or snippet such that no one can see or modify source code of your PHP script. 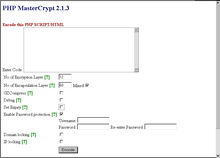 Lots of security measures can also be implemeted to make your script secure. This is a online currency converter tool which provide conversion among more than 150 currencies all over the world, this include all major currencies. These rates are updated on daily basis to ensure that you get the current rates. This is a Nslookup tool which is capable of LookUp for 12 types of DNS records for domains and IPs. This includes all common record types like NS, A, MX and many more. This can be be the best tool to check that your DNS administrator has configured your domain properly or not. 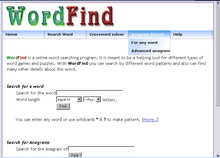 WordFind is a online word searching program. It is meant to be a helping tool for different types of word games and puzzles. With WordFind you can search by different word patterns, find anagrams and many other details about a word.